I haven't posted one of these updates in ten months. However, the Internet informed me that today (May 25) is "World Thyroid Day." I've found benefit from reading about others' experiences online, so this seems a good day to bring my blog up to speed. In summary, I was diagnosed with Graves Disease in February 2017. This is an autoimmune condition that attacks the thyroid gland and causes it to overproduce hormones to toxic levels. The mechanism that causes this is poorly understood, but an improper balance of thyroid hormones has a negative impact on nearly every function in the body. Thyroid hormones regulate the metabolic rate of all cells, as well as the processes of cell growth, tissue differentiation, and reproductive function. Symptoms of thyrotoxicity can be widespread and dangerous — the worst leading to heart failure. 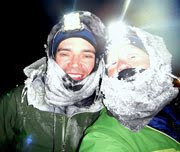 When I was diagnosed weeks before the 2017 Iditarod, I was warned under no uncertain terms that participating in a remote endurance race could kill me. The experience has been a humbling reality check, putting to rest whatever remaining endurance-racer delusions of grandeur I managed to carry into my mid-30s. However, compared to many cases I've read about online, my experience with thyroid disease seems relatively minor. I managed to stay fairly high-functioning throughout, and I wasn't pressured into having my thyroid radiated upon diagnosis. This is actually the default treatment for many Graves patients — a gland that is necessary for life is deemed too unruly and removed, so the patient must depend on synthetic replacement hormone to the end of their days, with varying degrees of adaptation. There are worse things, I know, but I strongly did not want this treatment if I could avoid it. 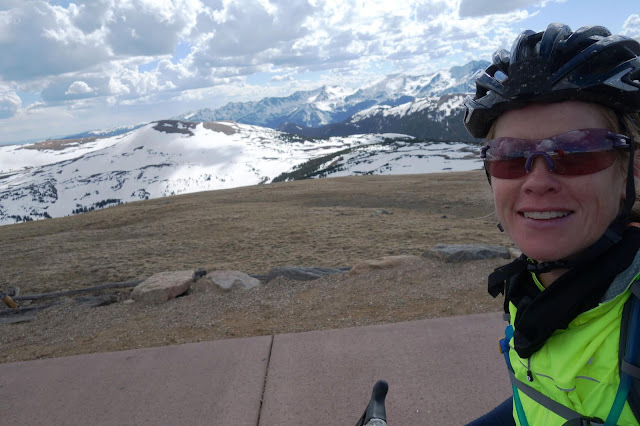 Happily I found an endocrinologist who not only decided that thyroid ablation wasn't necessary, but understands my passions and doesn't believe I need to give up adventures or endurance racing. I'm being treated with a medication that blocks thyroid hormone conversion in the liver. Whenever a friend teases me for "doping," I point out that any thyroid treatment — whether blocking or replacing hormone — is going to make any normal person feel really bad. Emphasis: Extra thyroid hormone is not performance enhancing. It's quite the opposite; this is one of those things that needs to be perfectly balanced, and it's annoyingly specific to the individual. When I started treatment, I needed to take a considerably high dose, which does have negative side effects and over time can damage the liver. The hope is to bring down levels quickly, which in turn decreases antibodies, until eventually the thyroid can function normally without medication. Adjusting to these fluctuations has been a mostly unfun rollercoaster ride, but I continue to move in the right direction under an acceptable timeline. Living in the "normal" range has been quite a revelation. Although outwardly I complained about my most prominent physical symptom — shortness of breath — the mental and emotional symptoms were quietly more disturbing. Before diagnosis in early 2017, I experienced strange brain fogs that occasionally settled in when I tried to read or write. I'd lose my train of thought and often not be able to return to whatever I was working on for the rest of the day. There were some really odd episodes when I started to wonder whether I was experiencing early-onset dementia ... for example, I was at the grocery store and grabbed a jar of mustard off the shelf, then had a lapse, for several seconds, when I couldn't read the label and couldn't fathom what I was holding. When I "came to," the realization of that cognitive lapse was jarring. I also had mood swings that boosted bouts of anxiety or depression. Back then, my thoughts often drifted to disturbingly dark places for no discernible reason. I blamed the political and cultural climate. There is some merit to this, but world affairs have not improved since last year, and yet my outlook is so much rosier. It's funny, really, when you realize how fervently we cling to an unwavering sense of identity, when so much of our intellect and emotion is based in our dumb body chemistry. So, yes, it's been a while since I had a cognitive lapse, and I'm in an overall better mood. Yay! Like my other symptoms, it has not been a steady rise. There are continued ups and downs, and I don't anticipate just being better forever, as easily as that. But the overall improvement is encouraging. As for my main physical symptom — breathing difficulties — that's also improved significantly. But this is also a messy thing. Along with thyroid disease, I also have allergic asthma — a separate autoimmune condition. The way my thyroid condition affects my heart results in general breathing difficulty that reduces my ability to exercise. However, I also experience occasional exercise-induced asthma attacks from constricted airways. There's research that shows that people with one autoimmune disease become susceptible to others, often during periods of illness or high stress. Anyway, I believe the allergic asthma came first, but has really ramped up in recent years. I'm also being separately treated for this condition with immunotherapy (allergy shots), so I'm a regular pin cushion with enough daily medications and supplements to fill a pill case. And you know what — I'm okay with this. As allergy season ramps up, my symptoms — which also include the usual itchy eyes, sneezing, etc. — remain greatly reduced compared to last year. Yay Western medicine! One of my benchmarks for good breathing health is "effortless PRs," which I continue to reach ... admittedly by putting a small amount of effort into them. But I'm no longer a gasping mess — I actually feel quite good when I'm pushing myself. Again, I don't expect to feel this way always — I've had a number of downturns in the past 15 months, and no reason to believe this is over. But for now, this mountain air is filled with oxygen, and it tastes so good. Two other metrics that I can track more easily than hormone levels are heart rate and blood pressure. My resting heart rate was never at the crazy levels you hear about from some Graves patients. But I used to see 85-95 bpm; it now falls closer to 60. I didn't even realize I was having blood pressure problems until this past January, when I applied for a prescription and was denied because my blood pressure was too high. The nurse took several readings before encouraging me to come back the following morning before coffee, where it was still registering 130s/100s. I've been monitoring my blood pressure ever since. It looked bad through February, but has improved significantly since I returned from Alaska in April. There are a few other symptoms that have improved greatly in the past few months — insomnia, hair loss, hives on my shin and ankles, and muscle weakness (okay, that could have been caused by endurance racing, too.) It's funny, because as my nighttime sleep improves, I've picked up more daytime fatigue — again, I view this as probably more "normal" than symptomatic in the other direction. I also find myself feeling cold when sitting around, and again, it probably just means that I've not as overheated as I once was. 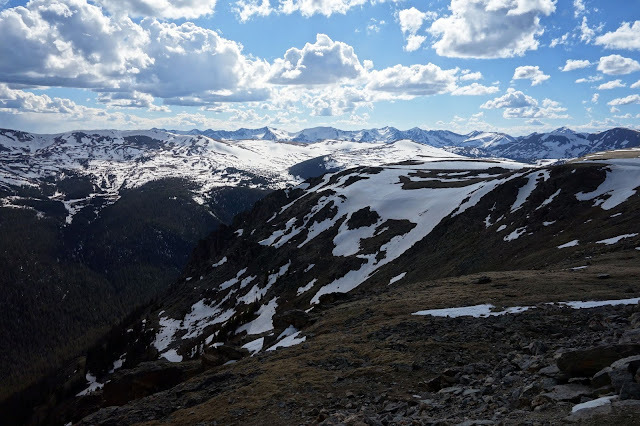 After an encouraging visit to my endocrinologist on Thursday, I celebrated with one more jaunt up Trail Ridge Road in Rocky Mountain National Park. I'd been led to believe they weren't opening the road until Friday, but to my dismay it opened two hours before I arrived Thursday afternoon. Traffic was already thick — not ideal, but at least drivers in national parks are generally courteous. Still, I don't see myself making this trip again this year, unless it's to ride the gravel of Old Fall River Road before it opens in July. 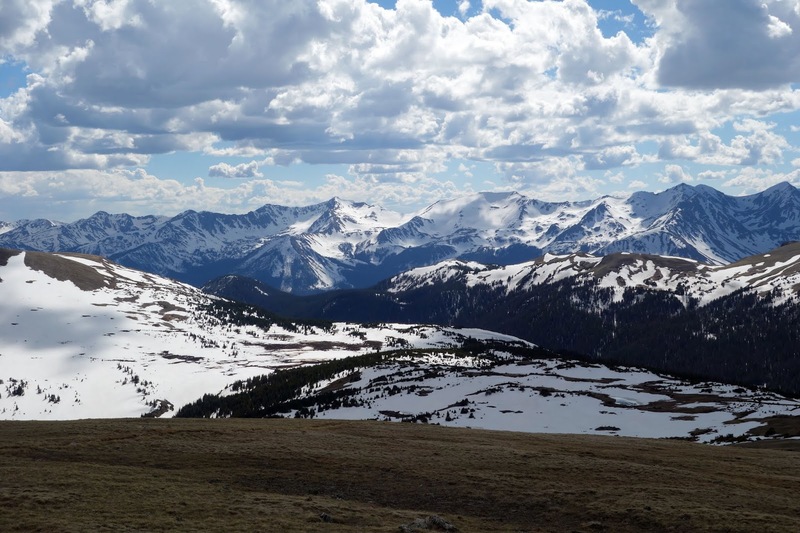 The weather was typical Colorado springtime — lovely at intervals, and then a squall would move in, the temperature would drop 20 degrees with blasting 40mph headwinds, followed by a burst of rain. Then it would be lovely again. I was amazed how much snow had disappeared since I was here two weeks earlier. I guess my window for spring snowshoeing closed during the broken toe episode. Summer is here, but that's okay. I have to admit that the weather in these mountains frightens me, and I'll miss this relatively benign season. 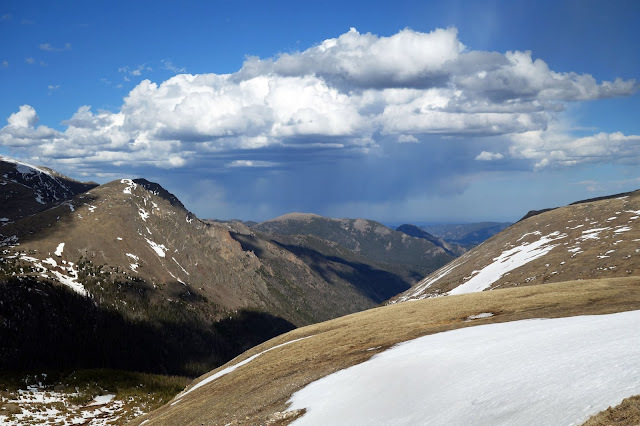 Winter is for 75mph west winds and avalanches, and summer is for microbursts, hail and lightning. Fall is probably a good season to plan big efforts, after monsoon but before the snow. Beat installed new tires on our road bike, "Sworxy," so I took it out for its first ride since late 2016. Oh, how I missed this bike. So nimble and fast, if a bit squirrelly. Without even trying, and despite a huge backpack (see aforementioned fear of mountain weather) and blasts of wind, I cut more than a half hour off my climb time verses the mountain bike two weeks ago (16 miles of near-constant climbing from 8,000 to 12,000 feet — that's pretty much Jill heaven, right there.) 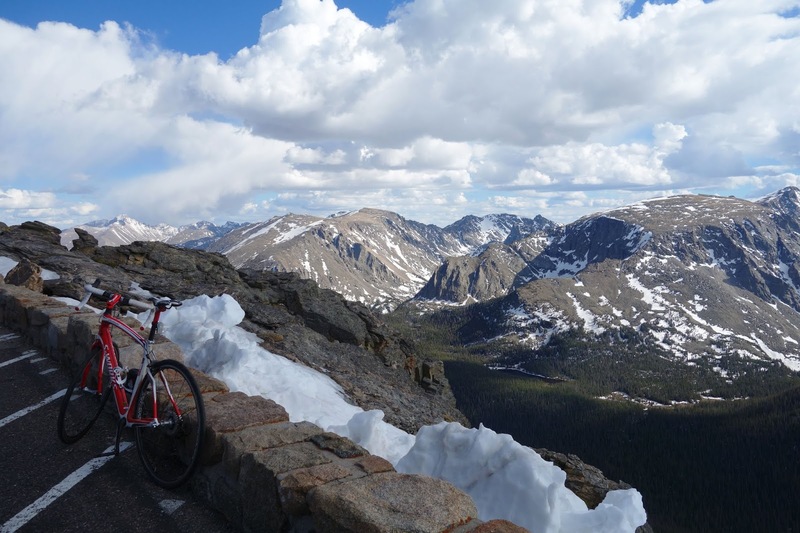 This time last year, I felt like I could barely breathe at 12,000 feet, at any level of effort. The improvements are no doubt only noticeable to me, but I find them staggering. My overall health and fitness cycle for the past year and a half would put late June at the bottom of a slump, so it will be interesting to see how I hold up this month. Either way, I am grateful for every good day I receive. Good health is priceless. Great news all around, Jill! Life is good! 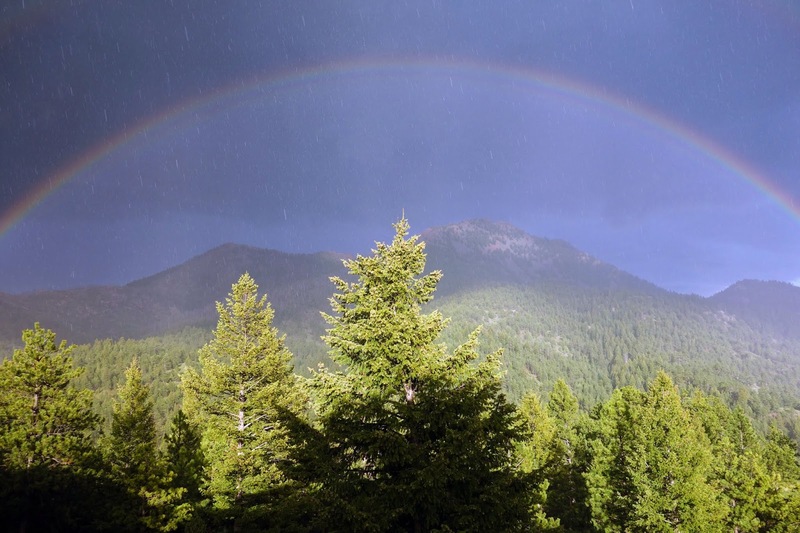 Love the rainbow picture! Maybe I'll get to see you this summer after my race if you guys are around! Yay for you Jill! SO very glad to hear you are finally getting this thing under control and have some light visible at the end of the tunnel! I can't even begin to imagine going thru what you have been...the diagnosis and treatment sound like such a crap-shoot! Sheesh, to even get it properly diagnosed would be like finding a needle in in a haystack it sounds like!Anyway, glad things seem to be on an upswing for you, and that you are getting good weather (I'm on my way back to the Springs on Tuesday for 2 to 3 weeks of work...sure hope the weax is more conducive to long mt bike rides than my last 2 trips!) You and Beat have a fantastic Holiday weekend! I guess I'm lucky, I just have hair of straw and have to eat very little despite lots of exertion. The lovely world of thyroid. Glad you are feeling better. Thanks for the update. Tho I'm Hypo, I can sympathize with how long it takes to zero in on dosage. It seems to be a moving target, especially for "active" types who love to push. Great update!! I'm so happy that you're having more good health times than bad! Woo hoo! Glad to see that you're feeling better. The last few posts have definitely been more upbeat which is great.